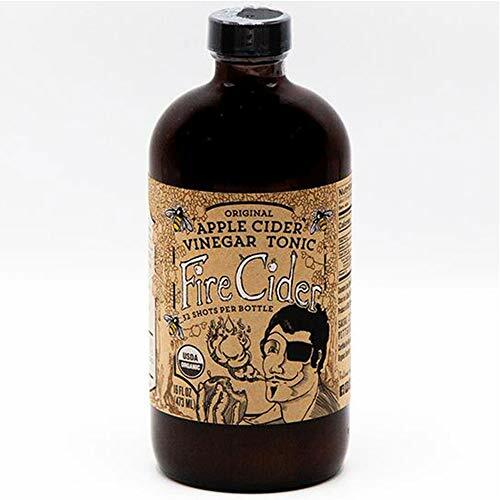 Made in New England: Fire Cider Apple Cider Vinegar Tonic with Honey & Dosage Shot Glass, Original Flavor, Natural Detox & Cleansing, Pure & Raw, Certified Organic Ingredients, No Heat Processed, 32 Shots, 16 oz. Fire Cider Apple Cider Vinegar Tonic with Honey & Dosage Shot Glass, Original Flavor, Natural Detox & Cleansing, Pure & Raw, Certified Organic Ingredients, No Heat Processed, 32 Shots, 16 oz. What's in it and how's it made? We're glad you asked! We toss a bunch of raw, organic, health-promoting ingredients like garlic, ginger, onions, horseradish, spicy peppers, turmeric, and citrus fruit to a base of raw organic apple cider vinegar. We let the vinegar extract all the plants' beneficial compounds and flavors over the course of six weeks, then mix in raw, organic wildflower honey to balance all that spicy tartness. It's a distinctive fresh-foods taste that's potent and energizing!